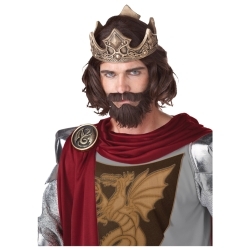 With its traditional long wavy look you can use the medieval kings wig for medieval kings, renaissance kings, or King Arthur. The medieval kings wig is colored as pictured. Wig is one size fits most using an elastic sizing band on the inside of the wig. Beard and moustache not included.